Disgruntled modern readers have many avenues to vent their frustration with books they feel fall short: Goodreads, customer reviews on Amazon and other sites, and countless book blogs. But just because 18th c. readers didn't have the internet doesn't mean they didn't make their displeasure known. 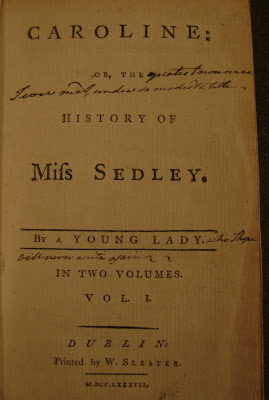 This is the title page, left, of a rare novel, printed in Dublin in 1787. It's so rare, in fact, that only a single lone copy is known to exist in a catalogued library, qualifying as a one-of-a-kind unique holding in the University of Pennsylvania library's research collection. Rarity, however, does not necessarily mean a good book, and it's possible that this one is in short supply for a reason. At least that's the judgement of an early owner. 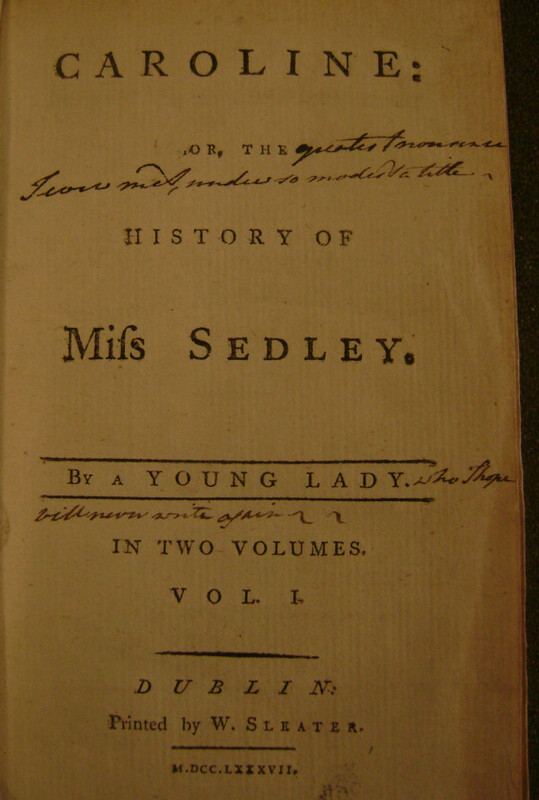 If you look closely at the title page (click on the image to enlarge), that long-ago reader made his or her reaction to this novel abundantly clear with a handwritten annotation. In case you're rusty reading 18th c. penmanship, I've transcribed it below in brackets. Oof! Land of the One-Star Wallbangers! Still, as a fellow writer, I hope the anonymous Young Lady never saw this "review," and continued to write as long as she desired. Who knows what she might have gone on to publish under her own name? Many thanks to Mitch Fraas, Bollinger Fellow at the University of Pennsylvania Libraries for bringing this title page to our attention. He blogs at Mapping Books, and you can follow him on twitter @MitchFraas. Above: Title page of Caroline, by a Young Lady, printed in Dublin, 1787. Collection of the University of Pennsylvania Library. When I was a kid I borrowed a children's copy of the Norse myth of The Ring, illustrated by artist Alan Lee in the library. I borrowed it and loved it. When I got to the end someone had written in the end papers a short note saying that it was a terrible book and no one should read it. I guess that was also pre-Goodreads days. Ah, makes me miss the days when a bit of white out could just erase stupid comments, now everyone posts nonsense all over the internet! If I hear one more person say Twilight is better than Dracula, I think I will scream! Thank you for sharing! I enjoyed this!